I wasn’t going to post another knife scabard just yet, but Hugh’s comment sort of prompted me. This was the first decorated piece of leatherwork I’d attempted, all the previous efforts had been roughly hacked out bits of plain leather with a couple of rivets. It’s also the one where I decided to use tools that were either readily available or could be found or made in a normal suburban house. Or as normal as re-enactors get. My motivation was to do a piece of top-shelf work without leaving the excuse for other people that they didn’t have the tools. Glenda had won a small knife with a rosewood handle a few years earlier and Iwanted to make a scabard for it. The one shown below from Parliament Street, York seemed to fit the bill. It was rather nice to have both sides of the original for once so I could see how the pattern should be laid out on the leather. As the blade of the new knife was straight, I simplified the design by omitting the raised section along the back of the blade. 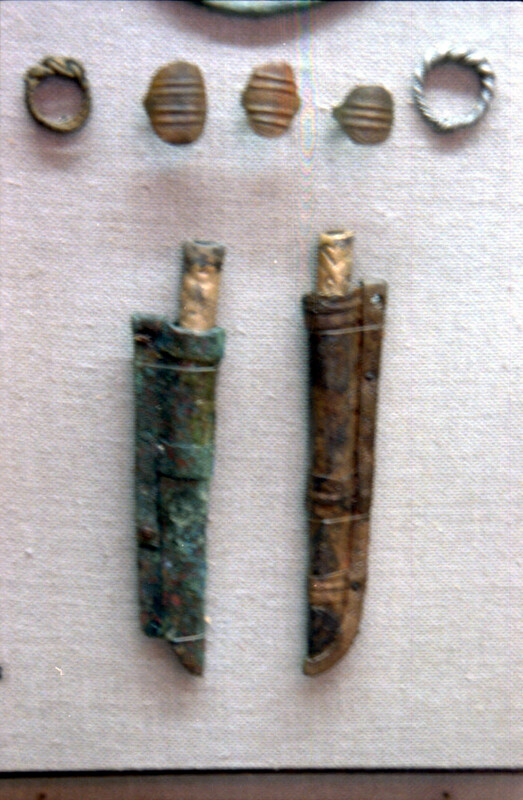 Many of the Saxon knife scabbards I’ve seen cover both the blade and most of the hilt, and have different patterns on each section of the scabbard to indicate which is where. When making knife scabbards, I make a copy of the knife in wood to use as a last so I can mould the leather to the knife shape without rusting the blade or staining the leather black from the iron in the blade. Some people just wrap the knife in plastic and use that, but I enjoy making the wooden model and sometimes draw the hilt decoration on to see if the design works in three dimensions. Make the pattern on paper by tracing one side of the knife, then the back, then the other side, allowing a bit extra for the bend radius of the leather (I allow half the leather thickness at each right angle bend), some more for the stitching margin and just a bit more for good luck. Then I draw the design of the scabard decoration. 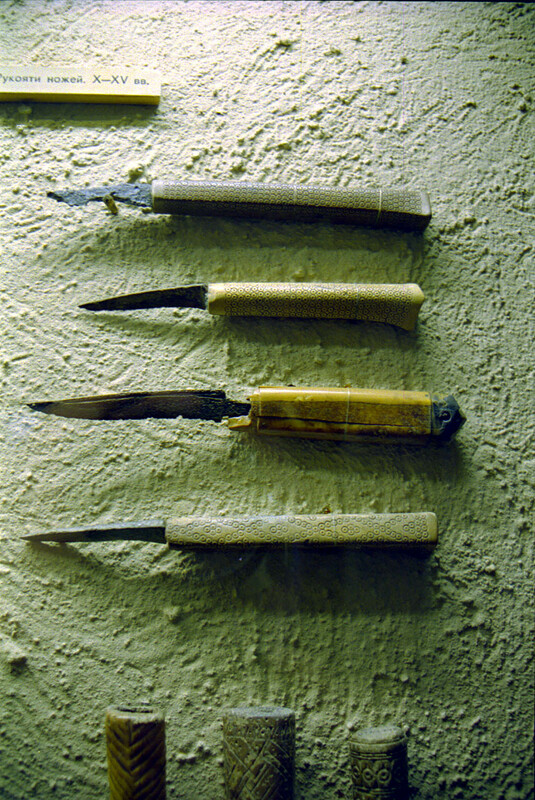 Using the awl or a sharp needle, prick small holes in the paper at the intersections and at sufficient points along the lines that the pattern will come through. Lay the pattern on the leather and mark the outside. I use a fine black felt-tipped pen and kid myself that it’s okay because 17th century embroidery was marked up with black ink and a crow quill. Put the perforated pattern on top of the leather and rub some ground charcoal or chalk through the perforations in the pattern. Join the dots with a pencil or ink if you like. The pattern and leather with the linear elements of the design embossed. 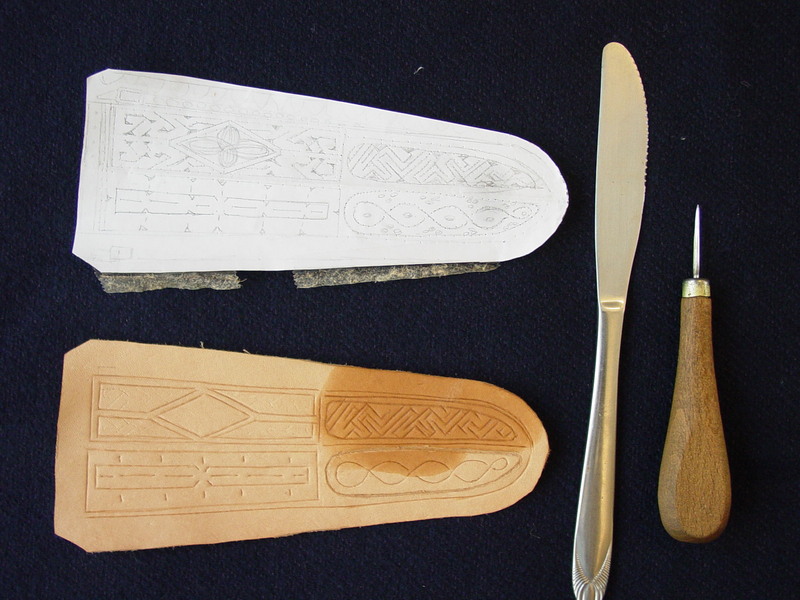 Dampen the leather and emboss the lines using the back of the butter knife. I find curves are easier if you roll the knife towards the point as you folow the curve. The photo below shows the stamps – a couple of bits of knocked off the corner of a fence post, a nail with the point knocked off and a curved bit of scrap iron from a spearhead socket. The spots along the bottom edge were done with the back of a series of different sized drill bits. 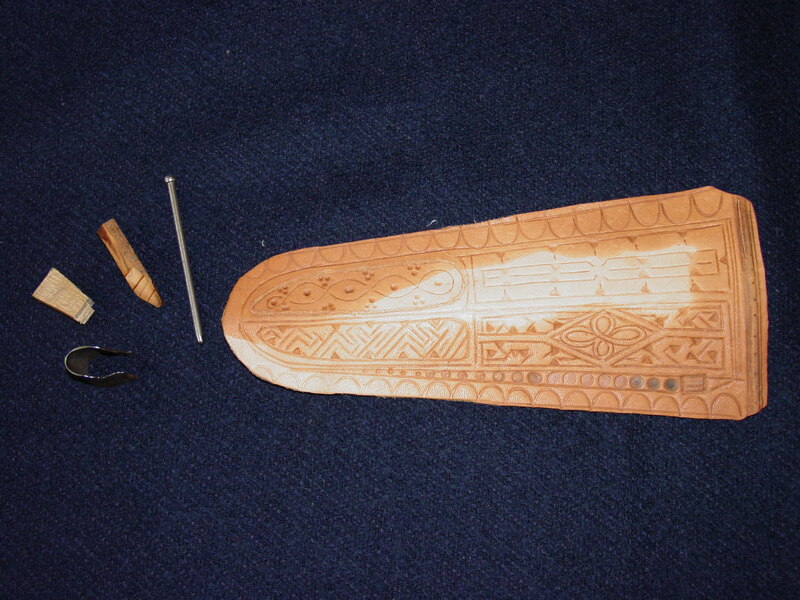 Once the embossing was finished, I dampened the leather again, wrapped it around the last , taking care to shape the flare from the flat blade to the round hilt and stitched the seam. While still damp, I dyed it by dipping in a tray of spirit based leather dye. 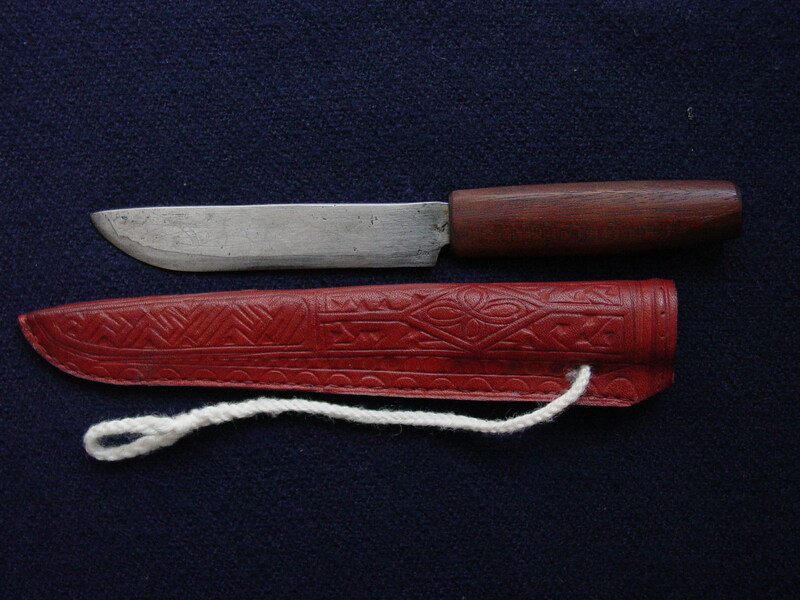 Saxon scabbard, the girdle loop is fingerbraided. Knife by Alex Schiebner, Talerwin Forge. 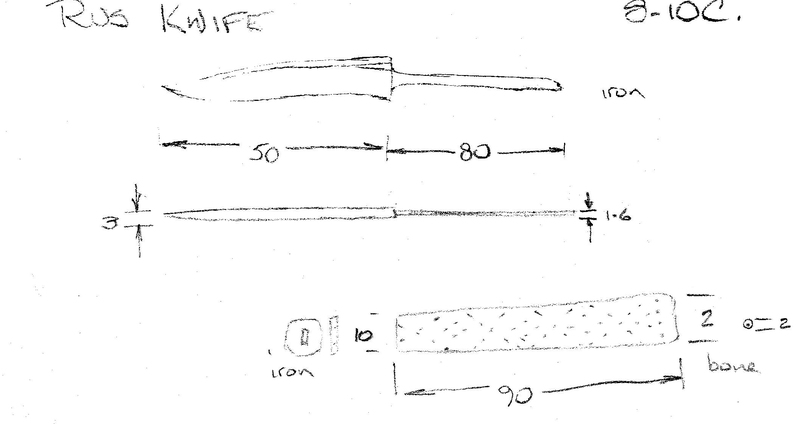 I took this photo in 2003 of the original, the scabbard looks much straighter than the report drawing. Reference: Tweddle, D., The Archaeology of York The Small Finds 17/4 — Finds from Parliament Street and Other Sites in the City Centre. York Archaeological Trust, 1986. At one event or other, Glenda and I were struggling with the usual Anglo Saxon sock problem – foot shaped bags made from woven cloth that were probably accurate but weren’t really confortable. Jenny offered to make us each a pair of naelbinded socks in exchange for a small Rus knife that she could wear slung off her girdle. The knife is based on photos taken by Chris Morgan at The Hermitage museum in Russia and augmented by photos I took of similar period knives in the Yorkshire Museum in York. To be honest, the blade isn’t the shape I’d first planned, but the steel didn’t want to be that shape so it’s the same as another one that the steel was happy with from the place and date. My black smithing skills are a work in progress. The scabbard is also more complex than the first one I’d chosen, I had planned to do a plainer/easier one but when Glenda’s socks arrived I realised how much effort went in to them and stepped up a notch. The steel is a medium-carbon (0.6%) cutlery steel from a billet left over from the 1940s that I was given on the proviso that I used it to make “medieval” knives. Hilt is a lamb leg bone, left over from a roast dinner, fittings are brass, the scabbard is 2mm vegetable tanned top grain leather, dyed with one coat of red Raven Oil and one of whisky Raven Oil. The chain is made from fine wire that I thought may be steel, but now suspect is stainless florist wire. Fittings on the chain are tinned brass. I tried to do as much as practicable with hand tools. 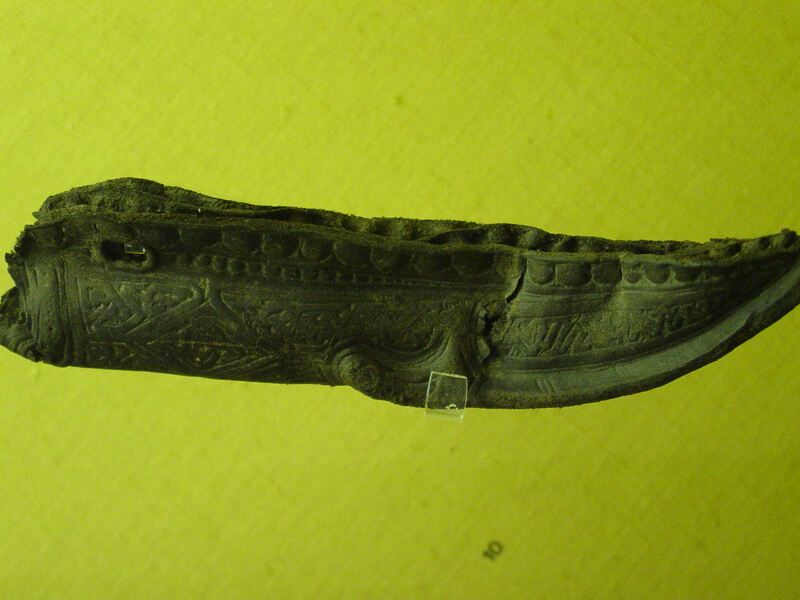 The blade was forged and heat treated, then ground to shape. The bone was cleaned, boiled and then left in the sun for the ants to finish off for a couple of months. Dot-circles were done using a tool made from a large iron nail, turned in a drill. I figure they could have used a bow drill to do the job. 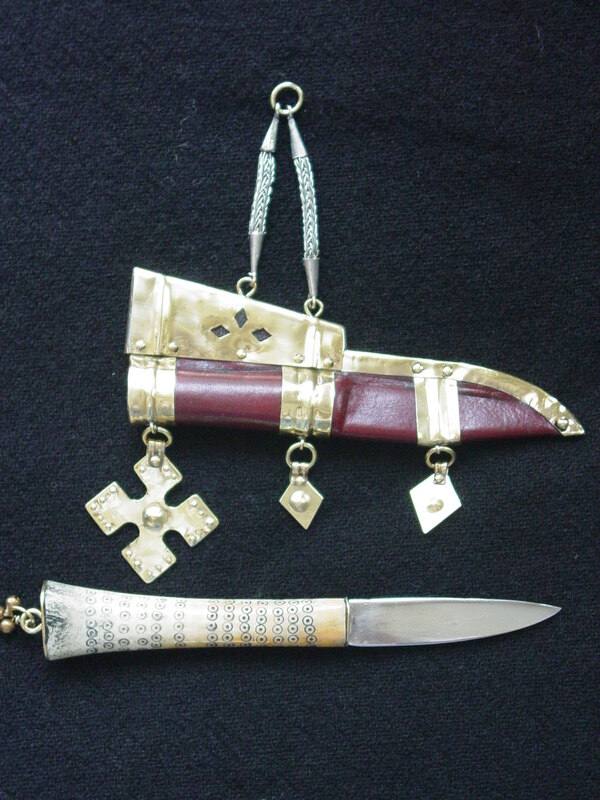 The brass edge strip was made by working sheet over an iron mock-up of the finished scabbard edge, and the rides in the bands were done in repousse using a block of Sydney Grey Gum (farmed on site) with a groove cut in it and a piece of 3mm brass rod tapped in from behind with a hammer. The blade and hilt were assembled, and then the leather was wet, wrapped around the knife and clamped to dry. 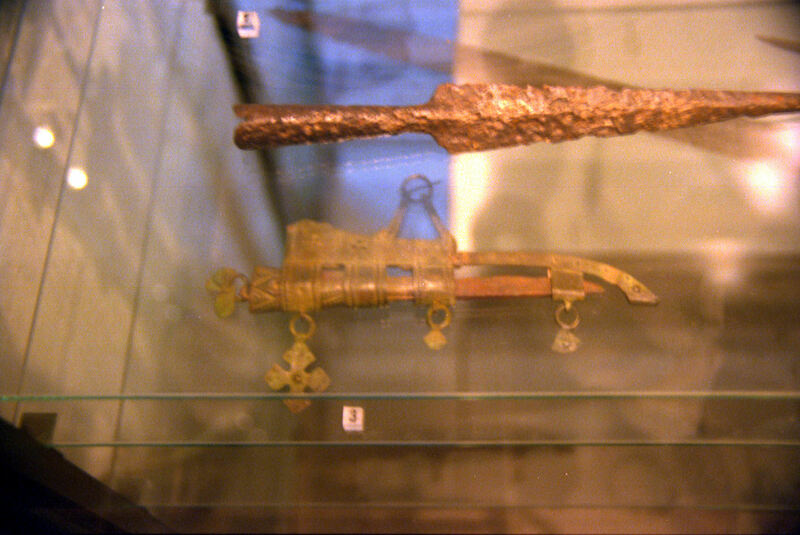 The brass cross and diamonds were cut, embossed using repousse techniques of the Viking period, and then attached to the mounting rings with riveted brass strips. Assembly was a simple matter of holding it all together and banging a few rivets in. 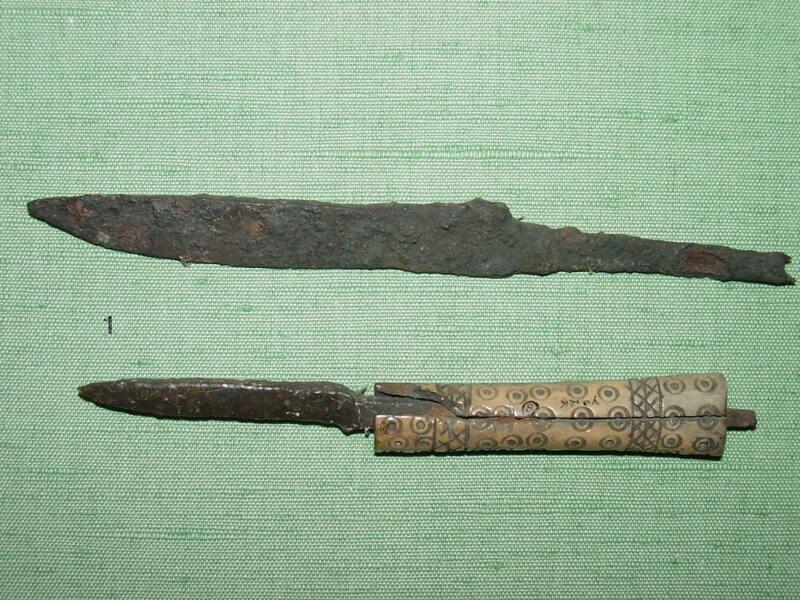 After that, the scabbard and knife had the various bits of trim attached with rings. The bells on the hilt serendipitously came from a new skirt Glenda had just bought. The kids were annoyed by the ringing, so they were removed and became surplus. Due to my habit of corroding metal, I wore light leather gloves throughout, and lacquered the hilt and scabbard once complete. The blade has been lightly treated with olive oil. The knife on the right is the one I’d originally planned to do… the bands on the scabbard and the edge are really from this knife. 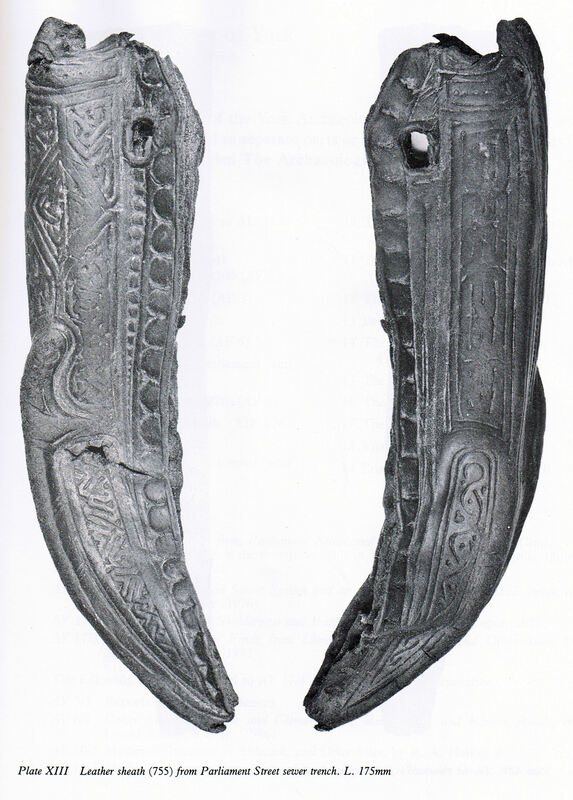 And some of its friends showing off bone hilts. The top two show a similar flare at the back. Basically, keep out of the rain, and dry the knife if it gets wet. The blade and bone parts of the hilt could do with an occasional wipe with olive oil, and at least once a year, feed the leather parts of the scabbard by waxing with a commercial pure bees’ wax and turpentine furniture polish from a reputable furniture store, and buff off. I’m happy to do any necessary repairs short of a complete remake. Thanks go to Chris Morgan for supplying photographs and design consultation.